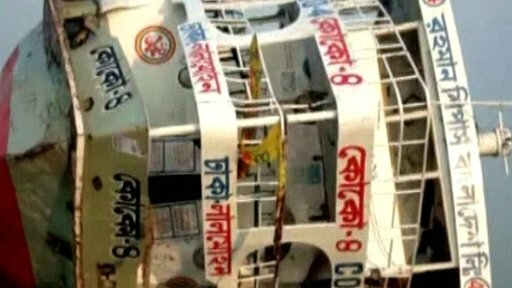 A crowded ferry carrying more than 1,000 passengers has capsized in southern Bangladesh. The accident happened when the MV Coco-4 arrived at the town of Lalmohan on Bhola Island. The weight of disembarking passengers caused it to tip and partially sink, reports said. Police say at least 28 bodies have been recovered. About 100 passengers are missing and there are fears many of those were trapped underwater. Divers searched for bodies on the lower deck of the triple-decked vessel, the emergency services said. "We have so far pulled out 28 dead bodies. Dozens more are trapped under water and are feared dead," district administrator Mejbahul Islam told the AFP news agency. More than 50 people have so far been rescued alive by cutting open lower cabins. Survivor Umme Kulsum Mittu said the launch was "absolutely packed". She claimed matters were made worse because inspectors insisted on checking tickets in Lalmohan - even though the vessel was sinking. "The law enforcement agencies in Dhaka should never have allowed such an obviously overcrowded vessel to sail, especially when the government has repeatedly pledged to stop this from happening," she said. Another survivor Shoaib Mesbauddin, who was trapped in his cabin for three hours, said: "I could not get out because the decks were so jam-packed with screaming people trying to escape. It was a nightmare from which I'm lucky to survive." Many of the passengers were travelling home from Dhaka to celebrate the Muslim festival of Eid al-Adha. The MV Coco-4 is one of Bangladesh's largest inland vessels. Ferry accidents occur frequently in Bangladesh, and are typically blamed on unsafe, ageing boats and overcrowding. This ferry - like many others in Bangladesh - did not have a detailed passenger list so it is impossible to know exactly who is missing.